Excited to tell you my family reunion was the best one yet, mainly due to all the good food in Penang. Yet, it still can’t come close to the flavors and love my mother put into her cooking. This will be a first in a series from my food journey in Penang. The front row left is the choy sum with dark green stems and leaves, above that is a box of delicious sweet pea stems which we had raw nearly everyday in our salads. Right infront is a box of baby bok choy. 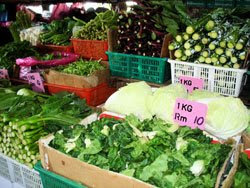 I really miss the wide variety and abundance of fresh vegetables and fruits at the markets, it makes me very homesick for Asian food. Everything is so cheap, you can eat like a king there. We mostly had salads for one meal and ate out another meal. Always tons of fruit for breakfast and after dinner. 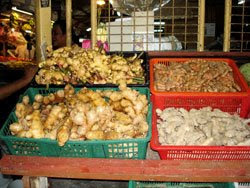 Four different types of ginger, top: young ginger, galangal (yellow ginger used in curries), bottom left is older ginger and right is even older ginger. 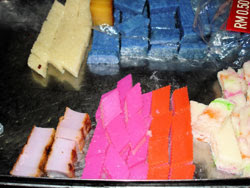 Desserts in bright colors, layered sticky puddings made with pea flour, sweet potato, sticky rice and gelatin. We love chewy, sticky desserts, yummy. The trick is not to refrigerate them because they solidify, so best to devour in one go! 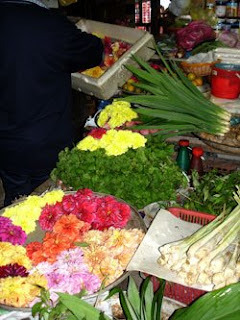 I love the way they decorate with flowers in between the vegetables! The little brown cone paper packages are so cute, filled with Nasi Lemak, which is rice topped with a delicious sambal (chili) sauce and little fried dried fish on the side, boiled egg and cucumber, all wrapped inside a pandan leaf which has a wonderful aroma. This is a perfect lunch item and you see them sold everywhere. More to come. By the way, it rained like cats and dogs the last two days there so we were glad we had some great days.